Garlic Escapes: Happy Australia Day! 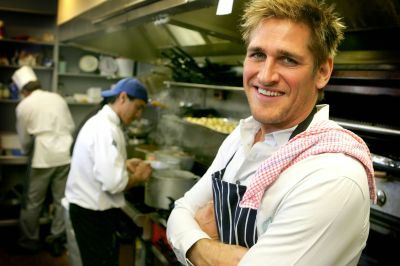 Okay, is there a better reason than Australia Day for a gratuitous picture of Curtis Stone? In all fairness, his recipe for Grilled Prawns (or as we say, shrimp) with garlic and snap peas is a welcome harbinger of spring. And I have it on good authority that if you call this "shrimp on the barbie," a dingo will eat your baby. Pre-heat a grill to medium high heat. In a large mixing bowl combine the prawns/shrimp, 1 T. olive oil, lemon zest and one clove of garlic. Season prawns with pepper and grill for 2 to 3 minutes per side or until lightly charred and just cooked through. Meanwhile place a wok over high heat until hot. Add 1 T. olive oil and heat until very hot. Add the sugar snap peas, remaining garlic and ginger and toss lightly for 30 seconds. Add the rice wine and salt, and stir fry for 2 minutes or until the sugar snap peas are bright green and crisp-tender. Mound the sugar snap peas on the centre of 4 serving plates. To make the vinaigrette: In a large mixing bowl whisk the vinegar, soy sauce and shallot. While whisking, slowly drizzle in the oils. Season to taste with salt and pepper. Place the prawns on top of the sugar snap peas and drizzle the vinaigrette over and around the prawns and serve immediately.